iScore Football Scorekeeper revolutionizes scorekeeping. 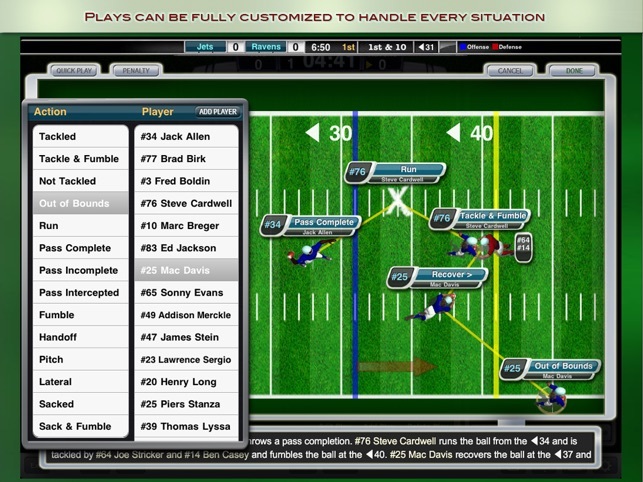 Track every pass, rush, fumble and interception like never before with the most intuitive football scorekeeping interface ever designed. Score youth football, high school games, college games, and even professional games just like the pros. Track over 150 statistics for Offense, Defense, and all Special Teams players. 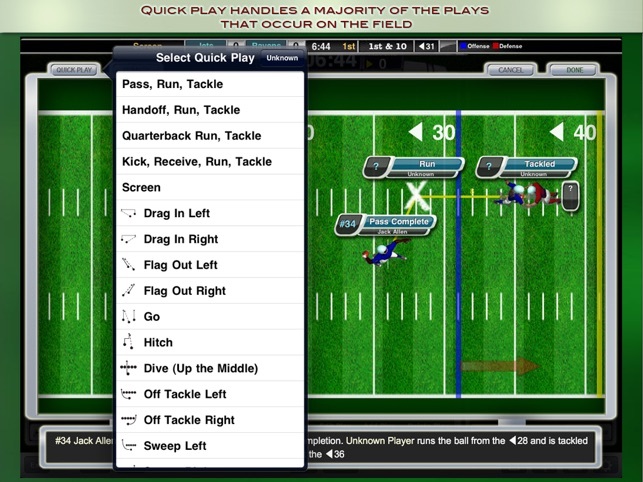 • Revolutionary Visual Scorekeeping -- Select the type of play (Run, Pass, Kick, etc) and then simply drag the players to the correct spot on the field. Player actions can be easily modified by tapping the player. • Partial play entry -- not sure who was involved in a play? Just enter what you see and you can fill in the rest later. • Complete Post Game / Post Play editing -- Edit anything about a play after the fact. Did not get it right the first time? With the visual scorekeeping interface, it is very easy to edit any details of the play at any time. 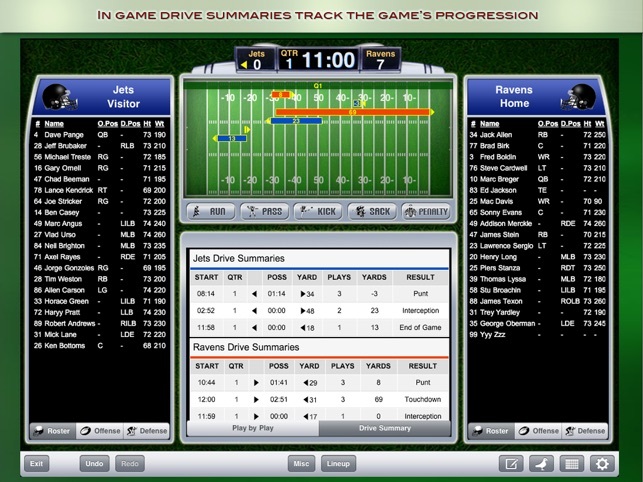 • Team Manager section -- Manage teams, team rosters and lineup at game time. • Quick Roster -- Generate teams with any number of players. 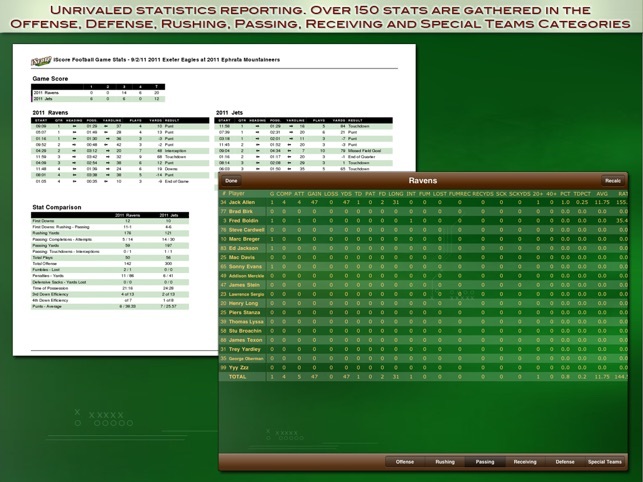 Cumulative and game statistics are available and can be emailed in EXCEL, CSV, and HTML formats. Coaches will never again have to spend hours trying to extract data from paper records just to see how their players performed. We respond very quickly to direct emails at support@iscoresports.com as well as to our forums at http://iscoreforum.com. Currently, when creating a player, you cannot assigns position unless you to go roster then back to the player page.. This product just keeps improving on what was already a very impressive football scoring app. It is extremely easy to use during the game and the stats produced are excellent. Using iScore Football has made scoring during the game so much easier and accurate. It has saved us a lot of time by not having to go back and watch game film to get accurate stats. They are accurate and complete the first time. The reports produced can be emailed directly to the media after the game saving us even more time. Parents and coaches also enjoy the customizable web site that can be created that has complete information about the season. Just as before, this product has continued it's improvement with the release of an iOS 5 compatible version which includes some bug fixes. This company really listens to its customers and responds. I can't say enough about how responsiveness of the iScore team. This app makes recording game stats super easy and it keeps getting better with every release! Used this app to score a game tonight and was very impressed. Extremely easy to use. Got quicker as I became more acclimated to it. It does lock up on occasion, but it restarts relatively quickly a starts up right where you left off. Some things I would like to see changed, to make things faster: when selecting play outcome, I would like to be able to select TD as cool as it is dragging the player all the way to the end zone, it would be much easier to hit TD. Perhaps I missed something, but I found it a little difficult to change the spot of the ball and downs/if they were missed or spotted incorrectly (that's not to say the feature isn't there, I may not know about it) Also I would like to see players listed by position when choosing who was involved in the play, would make it much easier on scorers for teams who have different backs/wr/te who would touch the ball regularly. But overall it's a fantastic and extremely useful app!